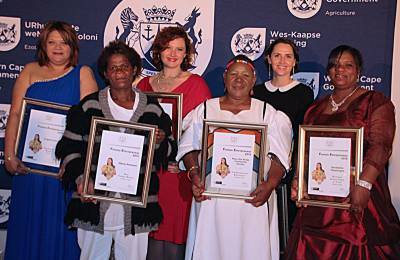 The Western Cape’s top female entrepreneurs in the agricultural sector were crowned during a prestigious event on the 19 August 2015 by Minister Alan Winde, Minister of Economic Opportunities. This competition is a partnership between the National Department of Agriculture, Forestry and Fisheries and the Provincial Departments of Agriculture. It is now in its 16th year and seeks to honour the sector’s leading women. When congratulating the winners, Minister Winde said, “It’s fitting that in Women’s Month we are able to celebrate the women who are making a significant impact on our agricultural sector. All the entrants are making a valuable contribution to food security, job creation and economic growth. It’s particularly important to celebrate women in this sector, which is generally seen as male-dominated. I am so pleased to honour their achievements”. The Western Cape Department of Agriculture is committed to developing women in the sector. Its goal is to move more women from subsistence farming through smallholder farming, to the point where they are able to export their produce. Minister Winde alluded further that the past winners were continuing to grow their enterprises. “Last year’s winner, Ilse Ruthford, who went on to win the national agri-processing award, heads up the financial management of a wine storage facility, that services over 40 producers. I was delighted to hear she would be launching her own wine label later this month. These are the kinds of stories we need to showcase”, said Minister Winde. Since 1999, more than 300 women have entered the competition, and of these seven have gone on to clinch the national award. Maria has worked in a range of areas at the nursery for the past eight years. Her key role is working with the research plant material that De Fynne grows for research institutions. De Fynne Nursery is a wholesale plant growing nursery and plum production farm. Moyo We Khaya, led by Tenjiwe Kaba, is a community garden in Khayelitsha tended by women farming with vegetables. According to the WCDoA this group stood out for an excellent service rendered to the community and for the inspiration they provide for other residents. Eugene started a small business in 2009 producing seedlings for family and friends. Currently, she produces nearly 7 million seedlings per year and has secured contracts with farmers. Jessica started the business in 2011 with a mobile tea caravan selling take-away tea. Today Lady Bonin’s is an international brand. The teas are hand blended with organic ingredients, using in-house recipes developed by Jessica. She specialises in wild grown, biodynamic and organic Rooibos, Honeybush and Buchu tea. Ingrid is the only female lavender producer in the Western Cape. She produces lavender essential oil, lavender cut flowers, dried flowers and handmade soap. Ingrid is the only person in South Africa to produce raw lavender honey. She cooks and sells traditional “Kaapse Moskonfyt”. Geraldine is one of a few female tractor drivers in the Western Cape. She heads an all-male team on Wildekrans Wine Estate in the Botriver Valley. The farm has various production activities such as vines, deciduous fruit, olives, pome fruit and sheep. The provincial winners from across South Africa competed for the National Awards in Durban where Tenjiwe Kaba was selected as one of the country’s top agri-entrepreneurs.